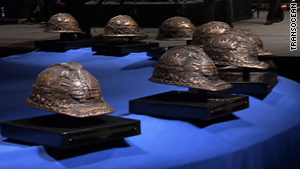 The service featured 11 bronze hard hats representing the 11 victims of the explosion. (CNN) -- As anger grows over the continuing oil spill in the Gulf of Mexico, friends and family gathered Tuesday, united in grief, to pay tribute to the 11 men lost in the explosion of the drilling rig that triggered the underwater gusher. "Today we gather here as a community -- a community that none of us ever wanted to be a part of," said Steven Newman, president and chief executive officer of Transocean, which owns the rig. "A community of loss, of remembrance but also of hope and most of all a community of faith. A faith that has been tested by this tragedy and one that we hope will be strengthened by this gathering." 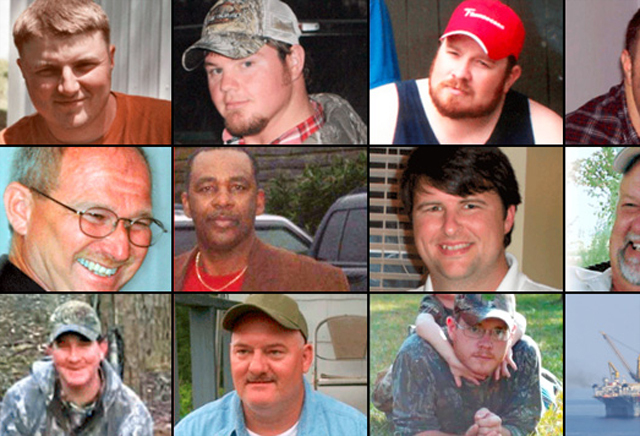 The men lost in the April 20 blast aboard the Deepwater Horizon were remembered as husbands, fathers, avid hunters and fishermen. "These were exceptional men," Newman said during the emotional ceremony. "They were colleagues and crewmembers. Hard-working men who loved their country and their god." A gospel choir sang religious hymns, and country star Trace Adkins, himself a former oil worker, gave a brief video statement before a photo montage was played to the soundtrack of his song about life on the rig, "Black Gold." Banners with the images of the victims -- Donald Clark, Shane Roshto, Dewey Revette, Adam Weise, Wyatt Kemp, Dale Burkeen, Jason Anderson, Karl Kleppinger, Stephen Curtis, Gordon Jones and Blair Manuel -- hung from the ceiling of the Jackson Convention Complex in Jackson, Mississippi. An engraved ship bell rang 11 times to mark each victim's death, and families were presented with one of the 11 bronze hard hats that ringed the stage to represent their loved one's loss. None of the men was found following the explosion despite a massive search effort. "It's hard for us," Naomi Beckham, the aunt of crane operator Dale Burkeen, said after the service. "We ain't got no closure. We don't have a body for him."